Hello, my name is AJ. I grew up in a very small town in Northeast Ohio where massage was not quite recognized as a viable career path. However after leaving my hometown and my comfort zone, I did some soul searching and finally found my incredible passion for Massage Therapy. I specialize in Deep Tissue, addressing the chronic knots and tension areas as well as the ever relaxing Swedish Massage. I trained under some absolutely incredible therapists and graduated at the top of my class from Fortis Institute in Towson Maryland. I consider myself a complete professional with a desire to aid in my client’s path to recovery and relaxation. I greatly look forward to working with you! This entry was posted in Dr. 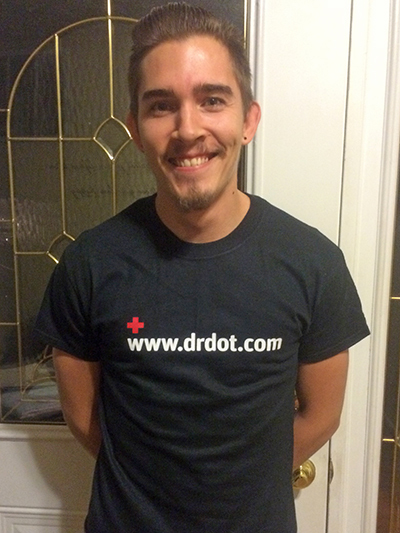 Dot and tagged 24, 24 Hour Massage Delivery service in and around Baltimore, 7, AJ, anapolis, baltimore, blog, Dr. Dot, home, hotel, lmt, male, maryland, massage, md, myofascial, office, reflexology, service, shiatsu, sports, team, therapy, venue by Dr. Dot. Bookmark the permalink.